Food trucks are making a statement. As many restaurant owners bypass the investment in brick-and-mortar stores, they have found that food trucks offer a more effective way to gain market presence, brand awareness, and ultimately increase ROI. Many of the leading nationwide food truck builders look to MAG Trucks as the most reputable dealer with the largest selection of new and used step vans. Whether you’re a restaurant owner, entrepreneur, small business owner, aspiring chef, investor or catering company, check out these tips that will help you retrofit a step van into a custom food truck! MAG’s sister company, APEX Specialty Vehicles, is the leading custom food truck and trailer fabricator in the United States and has worked with hundreds of clients. One of their latest projects was completed in only 45 days for Austin City Taco — an extremely tight deadline considering APEX’s packed production schedule! One of the reasons APEX locked in the project was because of the availability of having a step van on site ready to customize immediately. Many food truck builders have found that MAG offers the selection and delivery of 7-14 days, so they can take on the tighter deadline projects. 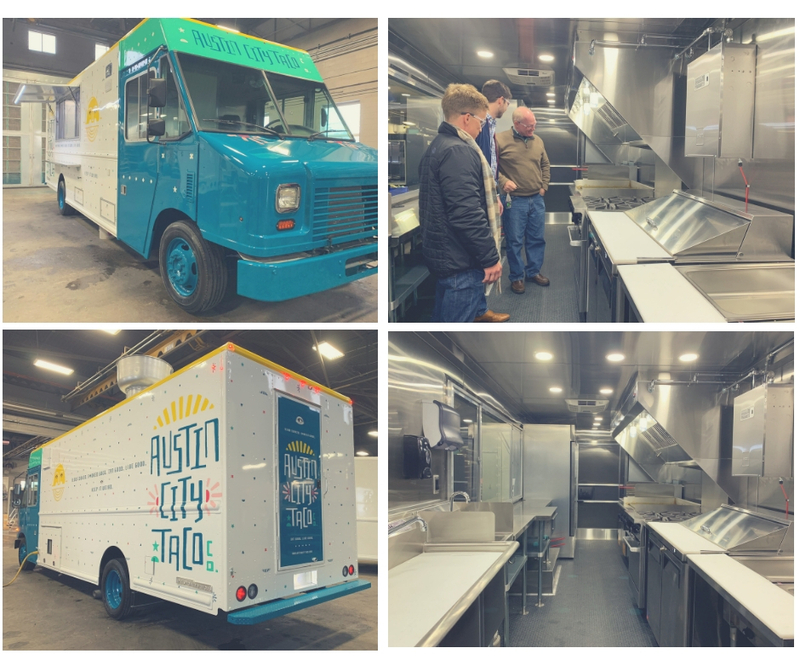 If you’re interested in reading more about the Austin City Taco project, click here and see how a step van was customized as a custom built food truck so quickly! Let’s continue with some tips to Retrofit a Step Van Into a Custom Food Truck. Tip 1: Outline exactly what you’re looking for… gas vs. diesel, price range, year, mileage, engine size, etc. When choosing a step van for a food truck build, it’s important to know exactly what you need in the step van. For the budget-conscious food truck operator, MAG Trucks has the largest fleet of used step vans on our lot and ready to go. From Freightliners from the early 2000s to low-mileage 2015 step vans, MAG Trucks updates our inventory daily and has over 50 used / reconditioned trucks on the website, ready to be delivered to you nationwide within 7-14 days. Be sure to ask for pictures of the specific unit. MAG Trucks posts pictures and videos of units on our website and our YouTube page, which helps the customer visually enter the step van and anticipate the updates needed to bring the unit to food truck standards. Ask the step van dealer about the inspection process. Does each step van receive a mechanical inspection? Can you get a copy of the inspection? Dealers like MAG Trucks have an in-house team that inspects every step van upon arrival to the MAG lot. What does the warranty cover? What does the warranty not cover? These are all important questions to ask the step van dealer, to have the right information to make a decision. A number of prominent food truck builders purchase step vans from MAG, then customize them once they get back into their facility. However, MAG does have the ability to uplift the step van if your timeline is getting backed up. It may be worth MAG adding a window or framing the serving area before the step van is shipped to your team to complete further customization. With many of our food truck builders, MAG has assisted in easing the fabrication timeline by getting some of the uplifting done in house and within your timeline. If you’re ready to browse the MAG Trucks inventory, you can check out NEW and USED options. When you’re ready to take the next step, give us a call 816.853.6672. We don't currently have any trucks that fit your needs. Let MAG help you find one. We can search nationwide for vehicles.